Frost Me Up: 4th of July and an Announcement! I have an exciting announcement! 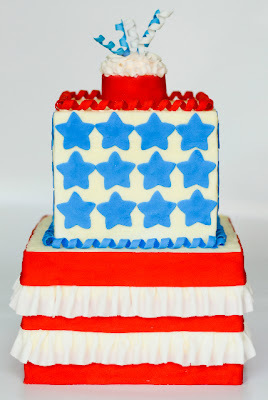 I have been chosen as one of the Top 5 "Fourth of July Edition" Tutorials on the Curious.com blog Here is the tutorial that they have featured this week. This website is a great way to learn step by step how to make a fun and exciting cake that will amaze your family and friends next weekend. Go check it out! It is good to know the important of 4th July. Thank you for the great post with useful information. It is good to read the details about the post. Veterans' Day 2017 is a government occasion (already known as Armistice Day) watched every year on November 11, in the United States as well as in numerous different nations all through the world. In the United States, it is a day that distinctions all men and ladies that have filled in as military veterans in the United States Armed Forces. Furthermore, Veteran's Day 2017 is the commemoration of the marking of the cease-fire, which finished the World War I dangers between the Allied countries and Germany in 1918. Veterans Day 2017 ought not to mixed up with Memorial Day; Veterans' Day praises the administration of every United State military veterans, while Memorial Day respects the individuals who kicked the bucket while in military administration. Get updated ico calendar for ongoing and upcoming icos reviews & ratings. If you want to research or invest in ICO then surely look in the Ico list in our website, and update yourself for the most promising active icos throughout the World.